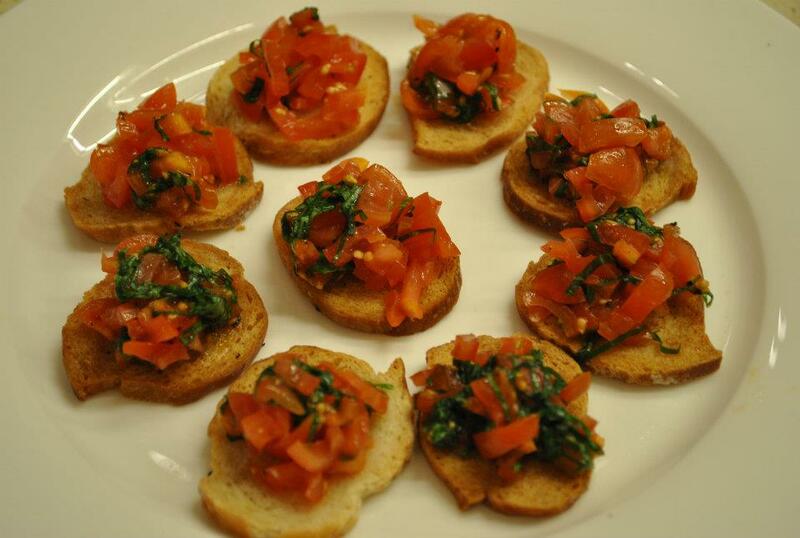 As you probably can imagine, I normally cook italian food while I have never tried any other cuisine at home. I have always been convinced that if i don’t know the real taste of the food from other parts of the world, i can not actually cook it properly. But for the cakes and dessert I’m happy to try. 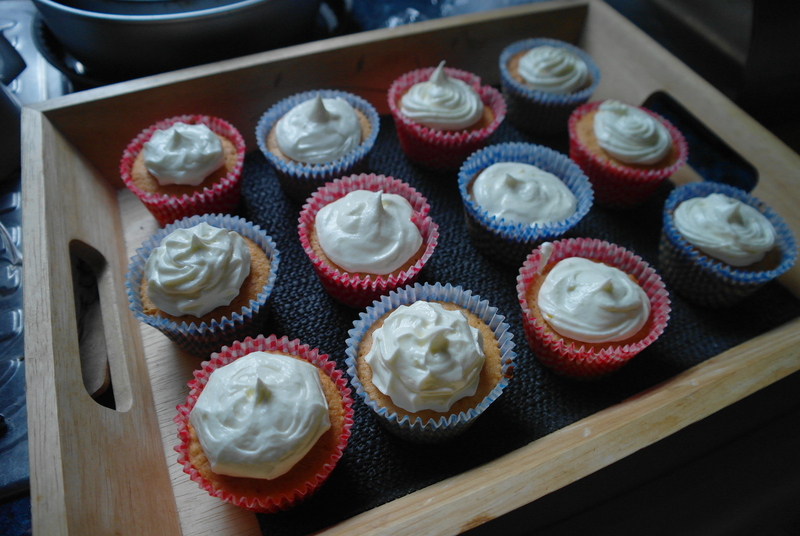 Finally in the italian tradition we have lots of sweet recipes from all over, so let’s see what i can do with the most classic lemony english cupcakes. 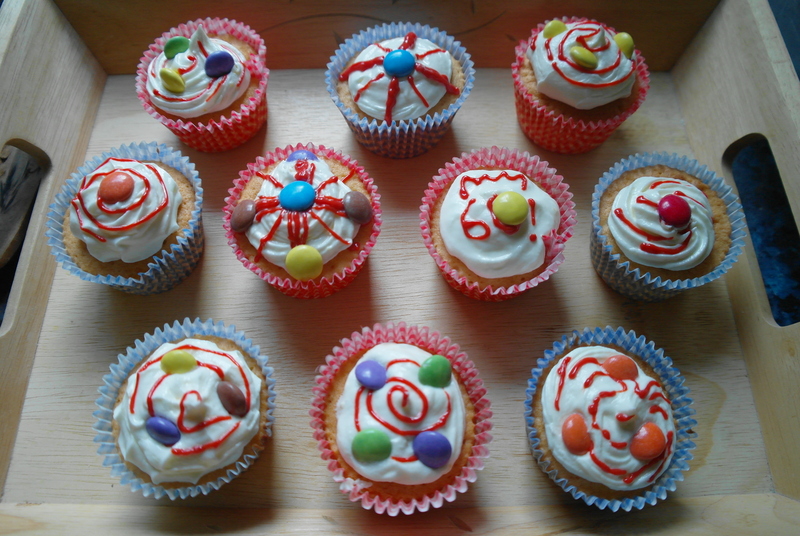 Here is the recipe I used and that i found online> I normally don’t like the cupcakes full of sugar on top. 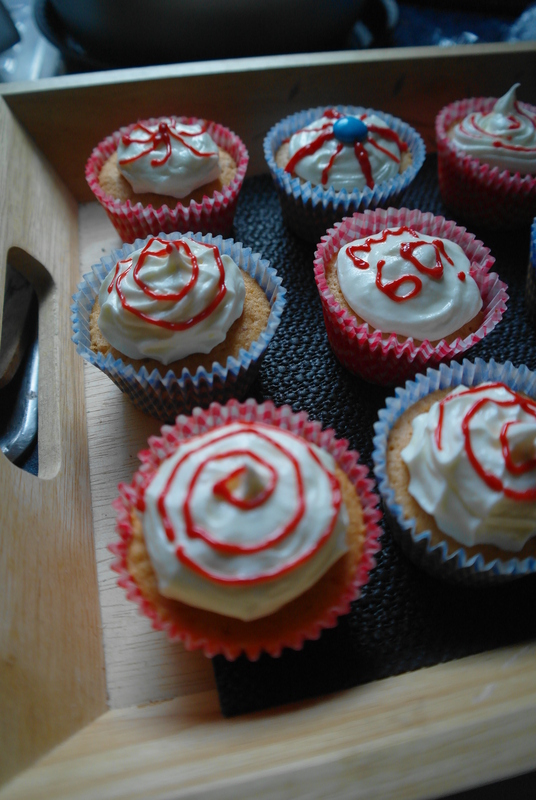 Yes they are beautiful but too sweet and i actually prefer the base than the topping. If you don’t make them enough big, there is no point. This recipe gives you exactly the right quantity of sweet I wanted on them. 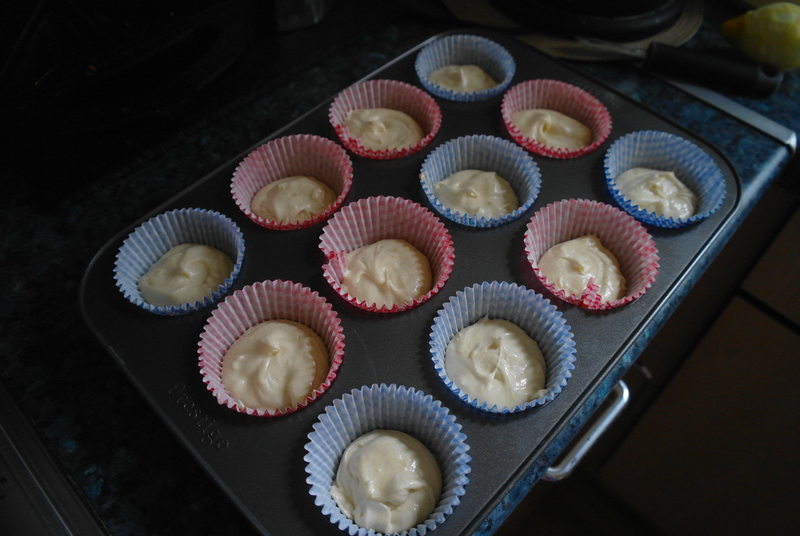 Preheat the oven to 180ºC and prepare the 12 cases in a 12-hole cake tin. Cream the butter until soft and then add in the sugar and the grated lemon zest. Mix until light and fluffy. 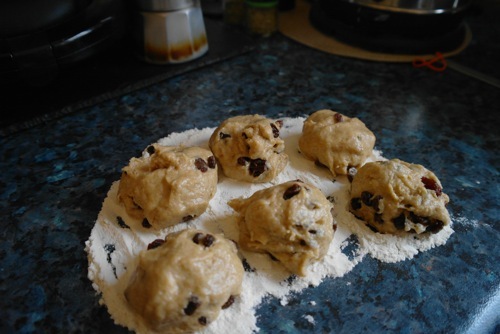 Gradually add the eggs, then the flour and the baking powder and fold. Divide between the paper cases and bake in the preheated oven for 7-10 minutes (not more), until risen and golden. 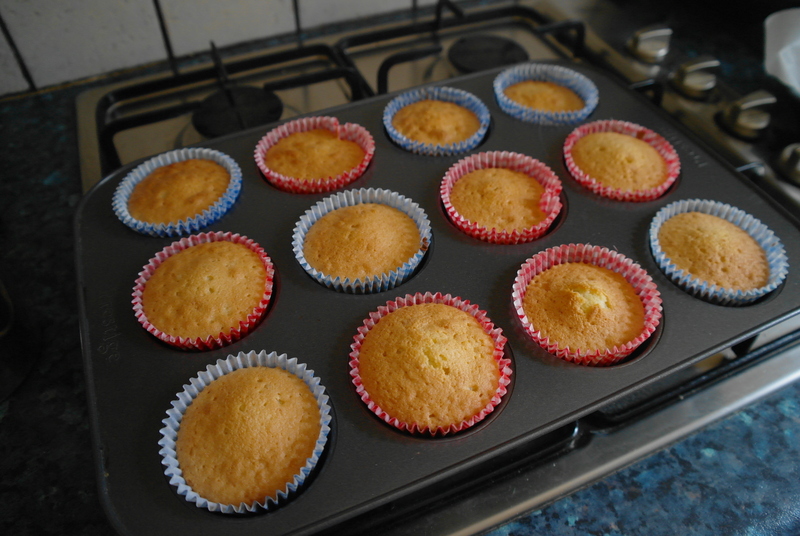 Remove the cakes from the tin and place on a wire rack to cool before icing. 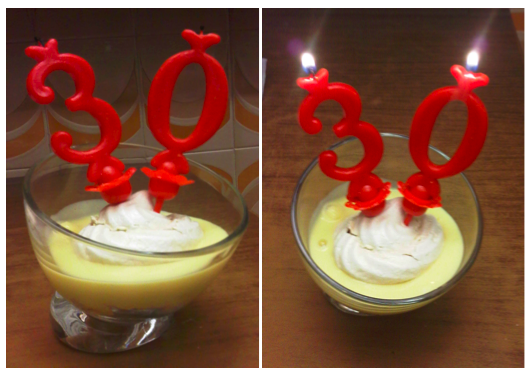 For the icing, cream the butter in a bowl with hand-held whisk until very soft. Gradually add the icing sugar and beat, then mix in the lemon zest and enough lemon juice to form a spreadable consistency. 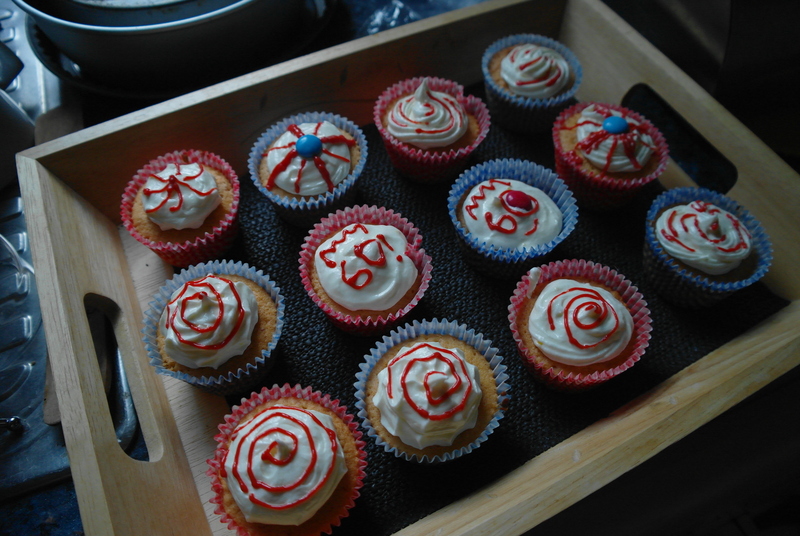 Once the cupcakes have cooled, put the icing in a pipping bag and create your sweet top and then decorate as you like! 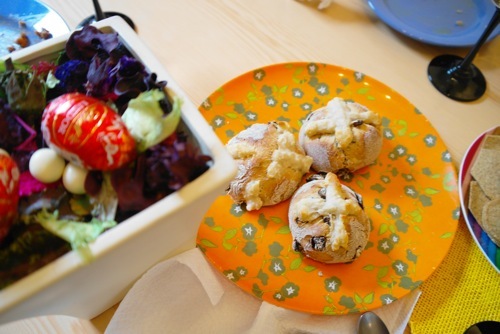 This Easter I decided to have a “mixed” Easter, putting together some food from the english tradition and some from the italian one. 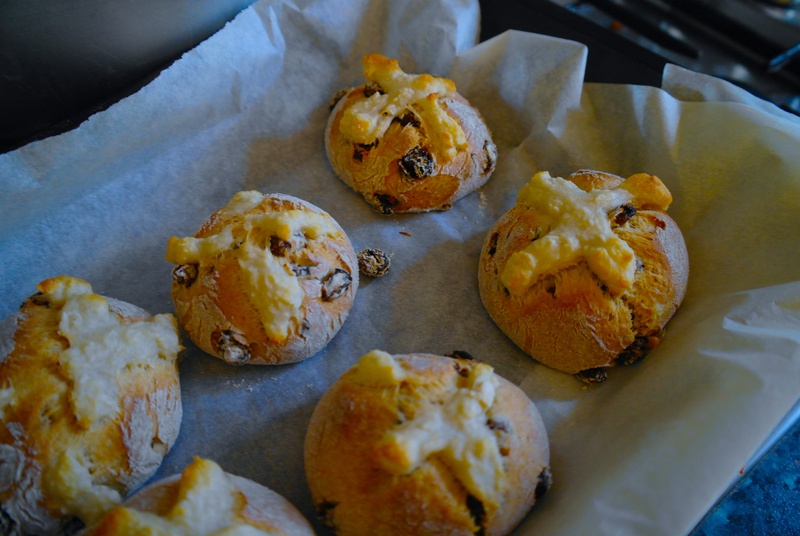 Maybe this happened because it was one of my first Easter spent in London… anyway I cooked Hot Cross Buns, a classic Easter treat for the good friday morning. 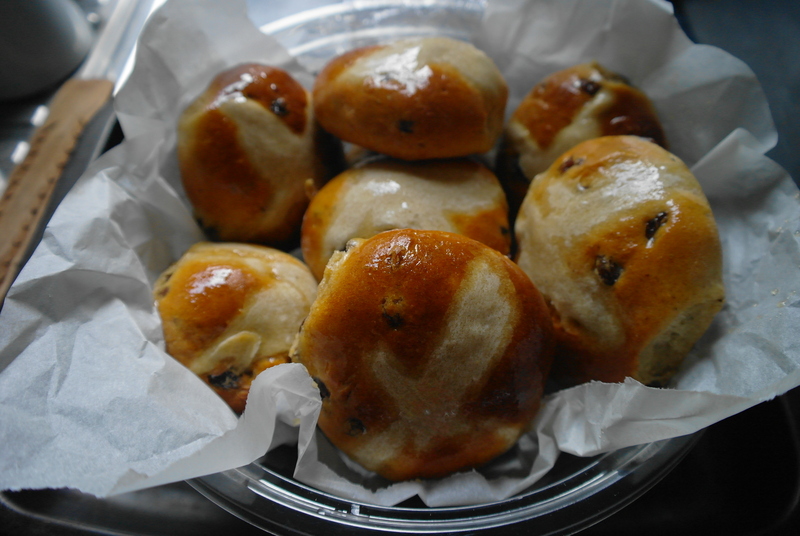 The buns were great and finally they are really nice and light…basically they seems sweet spiced bread and they are just amazing with honey or butter and jam! I will do them for all my future guests because for breakfast are really amazing! 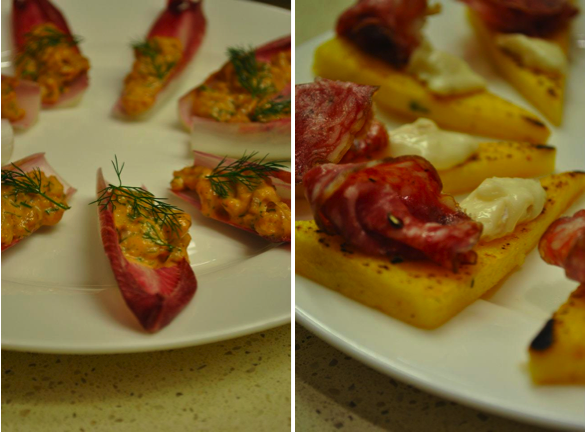 Here is the recipe i followed…a bit rewritten, following my taste and experience, from the BBC one here. Put together in a recipient the white bread flour, the salt, the sugar and the mixed spice. Then add the butter in pieces and mix with your hands. Add the raisins previously soaked and the yeasts. In another little pan mix the egg with the warm milk and then add this to the dough. Mix well and leave it rest for 5-10 minutes. 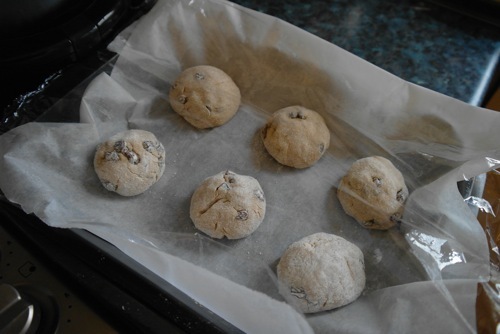 Now divide the ball in 6 little balls and put them on a baking pan covered by some cling film for around 1 hour. Let them raise and when almost ready, create the cream for the cross. You will just need to mix the flour with some hot water until creamy. 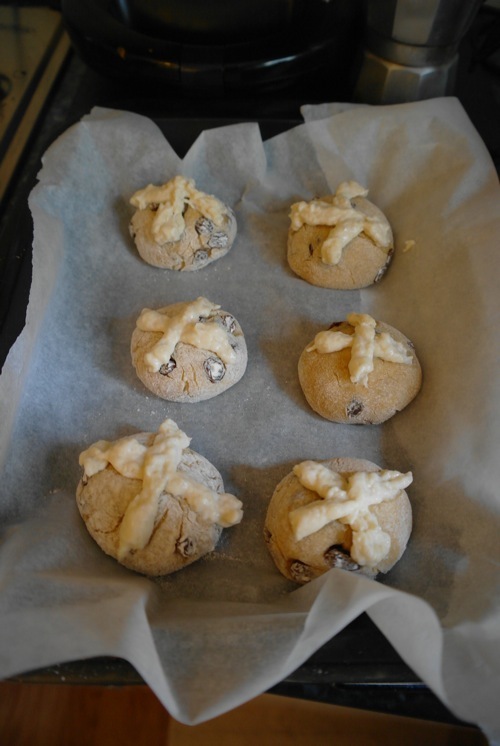 Then with a piping bag create the cross. Put them in an oven at 200 degree for 15-20 minutes and once cooked, brush with some honey and serve! Enjoy! 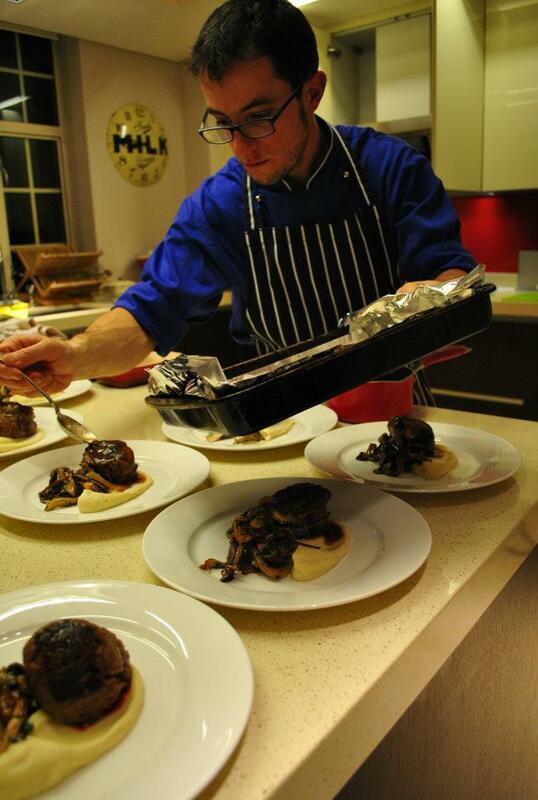 Do you want a secret to make any dinner or night with friend top? Just buy cheese and wine. Never like in the last months I met so many people in love with cheese and wine: french and italian of course, but also english, east european and australian too! 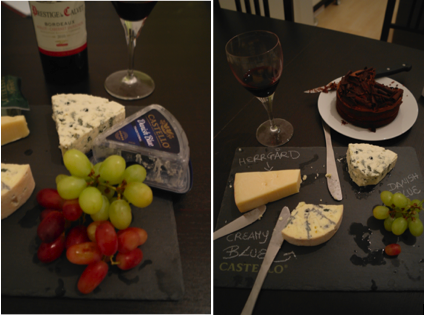 The combination of good cheese, crackers, grapes or apples and a great red wine is always a winner. 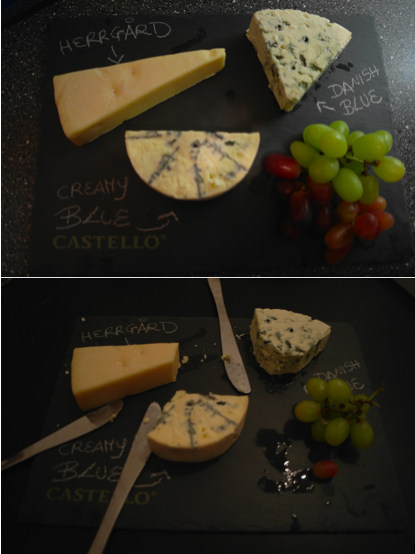 So what I lately received is a beautiful cheeseboard with some vouchers to try some danish cheeses: Castello. I normally buy cheese in the supermarket more than in delis, but mainly for a matter of time. Some of the supermarket cheeses are great anyway also if I miss lots of italian cheeses. 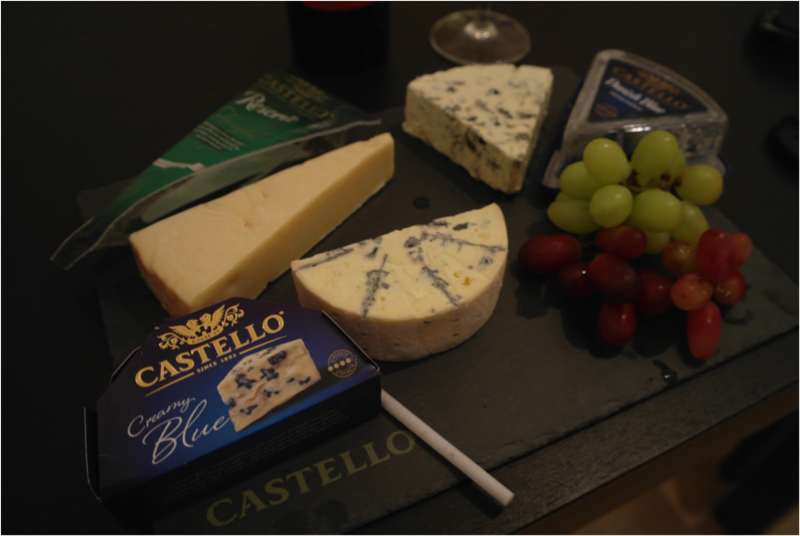 Castello cheeses are great for a classic cheeseboard: mainly blue cheeses but with taste and consistencies really different between them and great! When I went to look for them, I was a bit disappointed to find in the most common supermarket just the 2 different blue cheeses , the danish blue and the creamy blue, and the reserve Herrgard, but when I tried them they were really different and great for the purpose: one milder and harder, the other one slightly different and extremely creamy that with the nutty taste of the Herrdgard … Made anyone happy! And the cheeseboard where you can write the name of each cheese and dispose all the stuff in the most perfect way, it’s gorgeous! 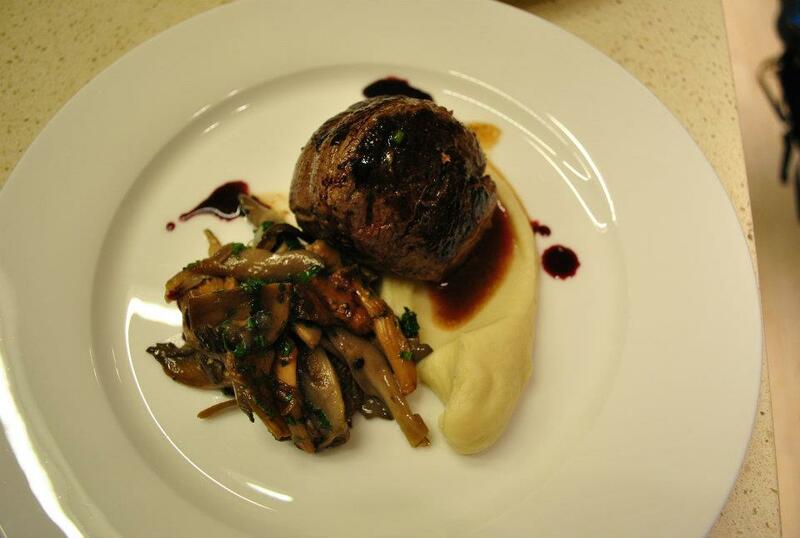 I really liked and enjoyed my Castello night…and i think you can see it in these pictures! 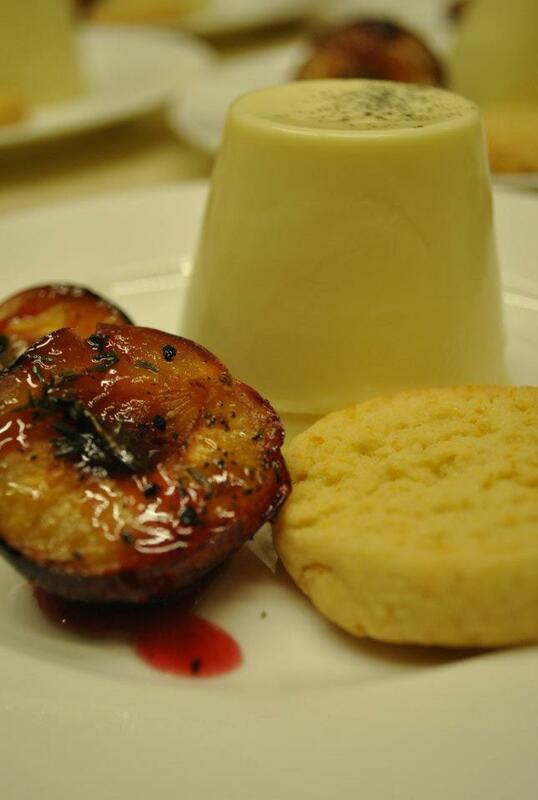 Recipe 7: This is one of the last dessert recipes I missed and it’s very well known in the north of Italy. I normally eat it in the summer when i go there, but it remembers me an european version of the mince pies and I decided to cook it in these days, when you need help to cope with the new year. Apple strudel for 6 people: you will need 300 gr of flour, 1-2 eggs, 170gr sugar, 1kg of apples, 50gr raisins, 25 gr pine nuts, 1 lemon’s zests, 40gr breadcrumbs. 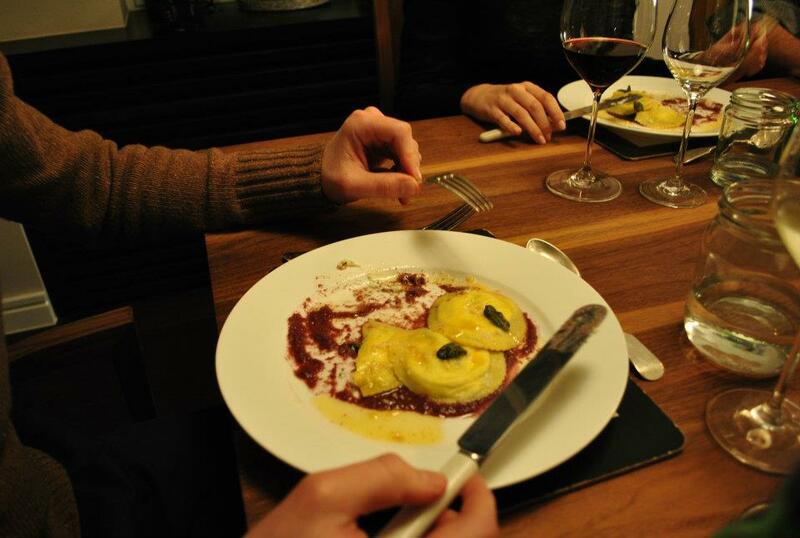 Work the flour with the egg, than add the butter and work them well with 10gr. of sugar. Try to do a ball with it and than place it covered in a hot recipient for half an hour. Peel the apple and cut them in thin slices, add the raisin previously soacked in some water to make them soft, the pine nuts and a some lemon zest. Now stretch the pasta not too thin and not too thick, cover it with 70gr melted butter until is all shiny. Then add some breadcrumbs previously passed in the butter remained, add some honey or apricot marmelade if you like it, some cinnamon and the apples with the rest. Now close the pasta creating a big roll, pass some other butter on top if you have still some and place in the oven for 1 hour at 190 degree. Serve it hot in slices with some icing sugar on top. Ps. Mamy buono quasi come quello nordico. Il loro e’ un po’ piu friabile ma la pasta e’ uscita benissimo!